"I grew up with this gravy! 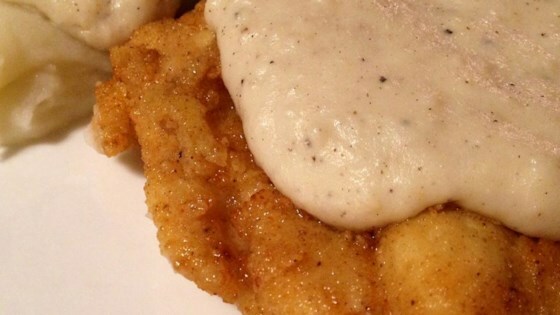 Everyone has heard of sausage gravy. Well, it don't compare to this! After frying your bacon for breakfast, use the bacon dripping to make true Kentucky biscuit gravy. Fattening? Oh yeah, you better believe it! Worth it? Yes! Pour over biscuits and serve with crispy bacon and eggs in any style." Heat bacon drippings in a skillet over medium heat; whisk flour into drippings until smooth. Reduce heat to low and cook the flour mixture until it turns a caramel brown color, stirring constantly, about 15 minutes. Be careful, the roux burns easily. Stir in salt and black pepper. Same recipe I've used all my life. Crumble the bacon and add it back to the gravy. Really Good. Yes good ole southern gravy been making this as long as can remember , but it does only require 2 cups of milk unless you have a large pan of drippings and more flour needed for the extra milk.